New York Yankees: In 1920, Babe Ruth joined the New York Yankees. In the 90 years that would follow, the pinstripes would appear in what would feel like almost every other World Series hence, en route to a mind-boggling 27 championships. The Bombers have sent enough brass to Cooperstown that they could open their own wing; 44 players enshrined to date with at least a handful more assuredly on their way. Ke y 5: Babe Ruth, Lou Gehrig, Joe Dimaggio, Mickey Mantle, Derek Jeter. Boston Celtics: The Celtics have been piling up hardware ever since Auerbach and Russell began their epic run of 11 championships in 13 years way back when. Today, the Green Men’s 17 championships is tops in the NBA. A ridiculous 33 men with Celtic ties are enshrined in Springfield. Key 5: Bill Russell, Larry Bird, John Havlicek, Bob Cousy, Paul Pierce. Minneapolis/Los Angeles Lakers: The absurdly inapt name isn’t the only thing the Purple and Gold carried over from the “Land of 10,000 Lakes.” Though they got whipped by #2 for much of the sixties, its hard to argue that since 1980, the Lakers have reigned supreme. Their 31 finals appearances is just plain stupid nasty, and at 16 championships, it may not be long before their cross-country rivals get overtaken. Key 5: Magic Johnson, Kareem Abdul-Jabbar, Jerry West, Gail Goodrich, Kobe Bryant. Montreal Canadiens: Though the Habs have been looking more like the Hab-nots as of late, history is clearly on their side. Canada’s finest have won an astounding 24 championships, essentially a quarter of all Stanley Cups won throughout history. They’ve also sent a stupefying 44 members to the Hall of Fame. Key 5: Guy Lafleur, Jean Beliveau, Henri Richard, Maurice Richard, Patrick Roy. UCLA Bruins Men’s Basketball: Behind arguably the greatest coach that ever lived, UCLA epitomized dominance in the sixties and seventies en route to an overall 11 national championships and 30 conference titles. After falling out of favor for much of the eighties and nineties, the Bruins seized back their prominence under Ben Howland with 3 consecutive final four appearances from 2006-2008. Key 5: Lew Alcindor, Bill Walton, Gail Goodrich, Ed O’Bannon, Sidney Wicks. Brazilian National Soccer Team: In the world of international soccer, Brazil is the gold standard-bar none. 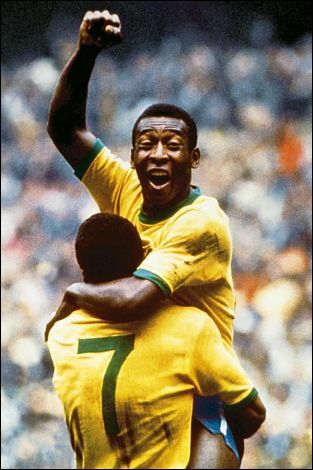 Of the 18 World Cups that have been held, Brazil has starred in seven finals, capturing a whopping five Cups. They’ve also raked in three Confederations Cups and eight Copa America Cups to boot. Key Five: Pele, Ronaldo, Garrincha, Zico, Rivaldo, Kaka. Alabama Crimson Tide Football: UCLA had John Wooden, Notre Dame had Knute Rockne, and Alabama had one Paul “Bear” Bryant.” From ’58-’82, Bear took the Tide to six of their fifteen (again, this is up for debate) national championships. Over their 114-year history, Alabama Football has captured 27 conference titles and appeared in more bowl games than any other NCAA school with 59. Perhaps their most mind-boggling statistic was somehow managing to go 113 years before finally producing a Heisman winner in Mark Ingram. Key 5: Bart Starr, Joe Namath, John Hannah, Don Hutson, Ozzie Newsome. Notre Dame Fightin’ Irish Football: Though the glory days of Notre Dame football are behind us (last championship was 1988), the Fightin’ Irish will always hold a special place in college football lore. Notre Dame leads all schools with 48 alumni in the College Football Hall of Fame, and positively churns out NFL talent like few others, having produced nearly 500 NFL draft selections and ten Pro Football Hall-of-Famers (Did someone say Joe Montana?). Though national championships are always a bit murky to conclusively determine pre-BCS era (and even post, sadly enough) many credit the school with 13 national championships. Key 5: Joe Montana, Alan Page, Tim Brown, Paul Hornung, Curly Lambeau. Soviet National Hockey Team: When most of us think of the Soviet National Ice Hockey Team, one phrase comes to mind, “Do you believe in miracles?! !” Well believe me when I tell you that that win for the Americans was a miracle and then some. From the mid-fifties to the early-nineties (when the communist empire crumbled), Soviet hockey ruled with an iron fist, winning just about everything there was to win for an international hockey team including seven gold medals over nine Olympics and another 19 golds at the World Championships. Key 5: Vladislav Tretiak, Vyacheslav Fetisov, Valeri Kharlamov, Sergei Makarov, Aleksandr Maltsev. Tennessee Lady Vols: Though the UConn women are all the rage today, when it comes to women’s college hoops, one school stands above all the rest, Pat Summit’s Lady Vols. In the 29 March tournaments that have taken place, the white and orange have appeared in 27 Sweet Sixteens, an astounding 18 Final Fours, and have won eight championships. Key 5: Holly Warwick, Bridgette Gordon, Deadra Charles, Chamique Holdsclaw, Tamika Catchings. Green Bay Packers, USC Trojans Football, UNC Tarheels Women’s Soccer, Iowa Hawkeyes Wrestling, Pittsburgh Steelers, UCLA Rugby, Duke Blue Devils Basketball, Chicago Bulls, St. Louis Cardinals, Real Madrid, FC Barcelona, Toronto Maple Leafs, USC Trojans Baseball, Detroit Red Wings, UConn Huskies Women’s Basketball, USA National Men’s Basketball, Juventus, Michigan Wolverine Hockey, AC Milan, Manchester United, Kentucky Wildcats, Oklahoma St Cowboys Wrestling, Texas Longhorns Baseball.